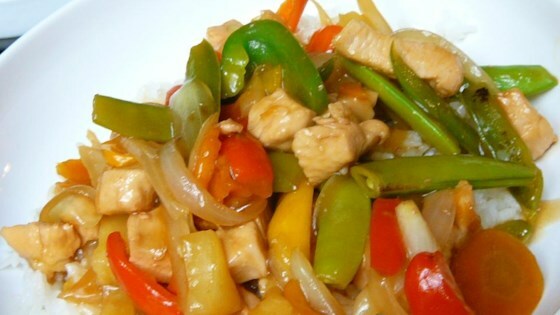 "This version of the Asian-style favorite includes carrots, bell pepper, garlic and pineapple. The requisite soy sauce and vinegar add the sour to the sweet, and voila! Serve over hot cooked rice, if desired." Brown chicken in oil in a large skillet over medium high heat. Add green bell pepper, red bell pepper, carrot and garlic and stir fry for 1 to 2 minutes. In a small bowl, combine cornstarch and soy sauce and mix together; pour mixture into the skillet, along with the pineapple and liquid, vinegar, sugar and ginger. Stir together and bring to a full boil. This was great - I followed someone else's review and used a larger can of pinapple for the extra juice. Next time, I would probably use tidbits instead of pinapple chunks. Totally try it!